I have yet to hear a guy say, “I just can’t believe it, she’s afraid of commitment!” This seems to be a well-worn cliché used mainly by women to describe recalcitrant men that they are trying to convert. So what is it about this word “commitment”? Commit to what? Are you committed if you only have one sexual partner in a long-term, monogamous relationship? Do you commit to the person requesting or even demanding supplication? This is a strange concept to me and, I dare say, to most males. How can we commit to a person when we both are in a state of continual flux of development and learning about ourselves and the other? I do believe in being committed – but to a concept or an agreed idea, not to the person. To me, being committed to a person seems to be akin to being a follower or worshipper of Big Brother in George Orwell’s book, 1984. The person we are to be supposedly committed to is the equivalent to an ogre, and will ultimately become a secret enemy to be defied. Granted, for every person demanding commitment, there is someone that will be willing to promise to commit. It seems like an arms race: demanding commitment and manufacturing the promise to comply. Someone making such a “promise” is really compromising themselves, I think, to such inconsistencies expected of them. *Notice that the words promise and compromise share the same root. Once the demand for commitment and the promise to comply are in place, they create cognitive dissonance, because the people involved have to justify this sad, compromised situation. A bastardization of the language ensues. For example, how do we reconcile our understanding that compromises are needed in relationships, while maintaining that we shouldn’t compromise ourselves? What a confusion and mismatch of inconsistencies! A promise does not allow for any new information to be added into the mix of a relationship, hence a paradox occurs: once promises and commitments are in place, real and diverse conversations cease. 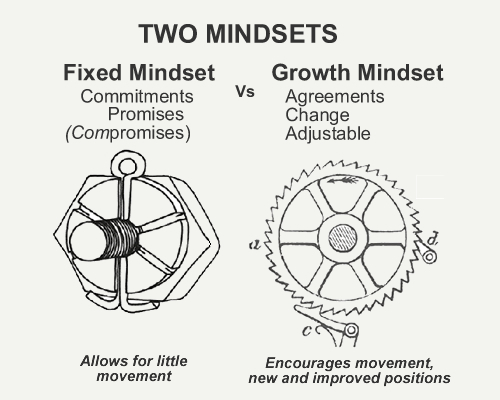 Being committed to a concept, however, is fine by me – so long as the concept or idea is a Rethink Idea, or Agreement. That is, open to be revisited at any time and not considered perfect or certain. The rules of golf are a standard set of regulations and procedures by which the sport of golf should be played. They are jointly written and administered by the R&A (spun off from The Royal and Ancient Golf Club of St Andrews), the governing body of golf worldwide, except in the US. The rulebook, entitled “Rules of Golf”, is published on a regular basis. There are over 300 road rules in Australia, and they are more or less standardized across the country. Obviously, the most important rules are that we drive on the left side of the road, stop at red lights, and travel at 60km on unsigned roads. Imagine a world without road rules. Probably the closest manifestation of this is to be found on inner city roads in India, where it resembles a free-for-all, with cows getting right-of-way and as a result, the traffic goes slowly and the efficiency of traveling on their roads is diminished. Now imagine a friendship, partnership or relationship without any rules of engagement. Everything would be hit-and-miss, and we might consider ourselves very lucky to have a single lifelong friend or partner. Disputes and complaints would be the norm, not the exception. Gossip would dominate most people’s conversations. Relationships would fail at a rate of approximately 50%, and the cost to society would be in the hundreds of billions annually. Conflicts, wars and the poverty they created would be ubiquitous, and the weapons used in those wars would create the biggest industry on the planet. No need to imagine this: welcome to the real world in the year 2012. So, why do we not have explicit rules of engagement, which we all agree to use, for interpersonal relationships? I guess the answer is pretty simple: whatever rules we tried to institute, there would always be someone that would try exploiting them, and us. Alas, we seem to have thrown out the baby with the bath water. We also seem to be hanging onto old-fashioned and traditional relationships that go back at least 100 years or more. It is 2012, with a world changing so fast that we are finding it difficult to keep up in most areas, yet we still are expected to commit to someone else and promise to stay loyal to them for the rest of our lives, regardless of future developments. Sheah! With such inconsistent demands being placed upon us, it’s no wonder there is so much mental illness in the world. Most people have their own set of standards or values and spend the rest of their lives trying to hook up with people that have a similar outlook. Rarely can a person succinctly explain what these values consist of. There are also implicit rules called manners or politeness, where a certain etiquette is assumed upon first meeting someone. The irony is that we seem to treat strangers with more respect than we do our nearest and dearest. When I mention the lack of common rules of engagement to most people, they tell me that personal relationships are all different, and that there is not one specific way to relate since we are all unique. I agree that if they keep saying there is no specific way, then there never will be a “way” for them or anyone in their orbit, but like the game of golf and the rules of the road, you have to start somewhere. I guess this has been the story of human development for the last few thousand years, with the rules of relating being imposed on humanity through religion, politics and philosophy. Oh, well, here we go again. Only I am merely proposing, not imposing, these rules of engagement to any willing takers, and emphasising that any agreement would only be on a trial basis and is always up for rethinking and discussion. I Am Right, You Are Wrong, where he describes parallel talking, which is when two people converse and share their thoughts. Think of two fingers standing parallel to each other. One says, “This is what I do and why. What do you think?” Then the other says, “Interesting, as this is what I do and why. What do you think?” And so the conversation goes, both speaking in a parallel fashion and comparing each other’s thoughts. Now let’s look at non-parallel talking. Think of two fingers starting in parallel again. “This is what I do and why. What do you think?” But this time one finger points at the other saying, “No, no! You can’t do that!! You have to do it this way.” Then the other finger also points: “What? Don’t tell me what to do!” And so the conversation spirals out of control, with both desiring to be right, and thinking that the other is wrong. My book is partly based on Parallel Talking and the agreed rules needed to get there and stay nearby. It’s a way to get back to the two fingers standing in parallel together, sharing their thoughts. And like the fingers, the two people’s shared thoughts can stand or fall simply by reason. If they stand, they stand; if they fall, they fall. They don’t need us to point our fingers at them. Having confidence in this principle, that is, confidence enough to just try it, is the beginning of the Rethink Perfect agreement process. Our attempts speak much louder than words. But what happens if one of us goes back to pointing our finger at the other? How do we protest without also pointing our finger? Well, this is where we are going to need an agreed-upon process or rules of engagement. For starters, I am proposing 6 concepts, all beginning with the letter A, that I think will achieve this process and bring us back to parallel talking. More on the 6 concepts in Chapter 5. “Agreement” = what you and I consider acceptable to us, for now. “Disagreement” = what you or I consider unacceptable to us, for now. These definitions are only related to interpersonal interactions, and do not take into account any legal and binding contract definitions for agreements. If we can allow these two definitions of Rethink Agreements and disagreements to stand for now, we can move on to Chapter 3 to try them out.